1, 4, 10, 20, 35, 56…. 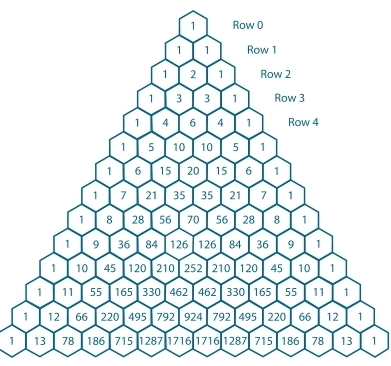 Therefore we also can find the tetrahedral numbers in Pascals’ triangle (4th diagonal column above). 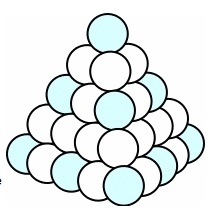 The classic maths puzzle (called the cannonball problem), which asks which tetrahedral number is also a square number was proved in 1878. It turns out there are only 3 possible answers. The first square number (1) is also a tetrahedral number, as is the second square number (4), as is the 140th square number (19,600). Having looked at some of the basic ideas behind the maths of stacking spheres we can look at a much more complicated mathematical problem. This is called Kepler’s Conjecture – and was posed 400 years ago. Kepler was a 17th century mathematician who in 1611 conjectured that there was no way to pack spheres to make better use of the given space than the stack above. The spheres pictured above fill about 74% of the given space. This was thought to be intuitively true – but unproven. It was chosen by Hilbert in the 18th century as one of his famous 23 unsolved problems. Despite much mathematical efforts it was only finally proved in 1998. The Poincare Conjecture – the search for a solution to one of mathematics greatest problems.